Older, less popular peels tout the “No Pain – No Gain” approach to skin care. Before the Perfect Derma Peel, Skin Therapeutics medical grade chemical peels and the new Epionce peels, people believed the deeper, the more painful, and the more downtime of the peel – the better the result. Not anymore! These are the “Next Generation Aesthetic” peels. They are nearly painless, yet produce dramatic, visible results in just days with little downtime. Dr. Trussell started offering medical grade chemical peels six years ago. During this time she has tested numerous other peels on herself and her staff (and a few willing friends). She kept coming back to the Perfect Derma Peel which contains trichloroacetic acid, kojic acid and glutathione (an anti-aging ingredient). In May 2014 she introduced 13 new medical grade chemical peels from the Skin Therapeutics line so that we can better tailor your treatments to your specific needs. 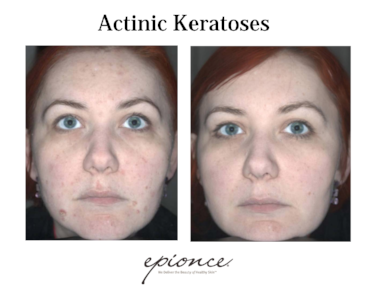 Most recently she added in the line of Epionce peels which compliment our full line of Epionce medical skincare products. She and our aesthetician prefer these medical grade chemical peels because of the amazing results. And patients unanimously prefer them over other harsher peels!! Our aesthetician will do a full skin analysis and help you decide which of these is best for you based on your skin type and concerns. The Perfect Derma Peel can be used on any skin type or ethnicity. It is effective on melasma, acne and acne scars, sun damage, fine lines, and enlarged pores. Following your peel, you will experience skin flaking and peeling beginning around day 3 which may last 1-7 days. This peeling may be disguised by using a moisturizer. Included in the price of your peel is a complete post peel care kit to take home with you. You can apply makeup as soon as four hours after the Perfect Derma Peel is applied. The Perfect Derma is very popular not just on the face, but also on the neck and chest, or on the back and shoulders for acne. It is also very helpful for removal of sun damage on the hands, especially when combined with IPL treatments. Great results are usually visible even after just one treatment. Skin that is properly maintained with chemical peel treatments on a regular basis and correct daily skincare tailored to meet your individual needs, will keep your skin looking youthful and radiant. The Perfect Derma Peel is the first peel to contain the anti-aging ingredient glutathione. Glutathione is the ultimate antioxidant known to prevent damage to important cellular components caused by free radicals and peroxides. As we age our glutathione levels are depleted due to sun exposure, air pollutants and other environmental stressors. Glutathione penetrates deep into the cellular level of the skin to fight oxidant damage and is the anti-aging answer to premature wrinkling. Glutathione is proven to reverse the melanin's metabolism turning dark pigmentation into light pigmentation. Skin Therapeutics was developed by Dr. Milton Waner to better treat his patients after surgery and to remove facial deformities. Backed by years of research, Skin Therapeutics has proven that exfoliation without irritation, and infusing skin with rich vitamins and proper moisturizers will bring radiance to even the dullest of skin. Since Skin Therapeutics was developed by a physician, these products are medical grade and use the correct amounts of active ingredients for optimal, results. In addition...they are AFFORDABLE! At Sei Bella Med Spa we address a wide variety of skin problems...acne, acne scarring, melasma, sun damage, fine lines and wrinkles, rosacea, and uneven skin tones to name a few. To better customize each person's particular treatment, Dr. Trussell added 13 new peels to our line up including Mandelic, Jessner's, Ultra Jessners, medical grade lactic and glycolic acid blends, and salicylic acid peels. $100 Maintain your results with the appropriate cellular turnover treatment from the Skin Therapeutics line. This will maintain the results of your peel. The Epionce™ Peel System utilizes the power of nature! It features good things like naturally occurring fruit acids and enzymes to prompt your skin to increase its cellular turnover. This means that the collagen production, which slows as we age, is sped back up.